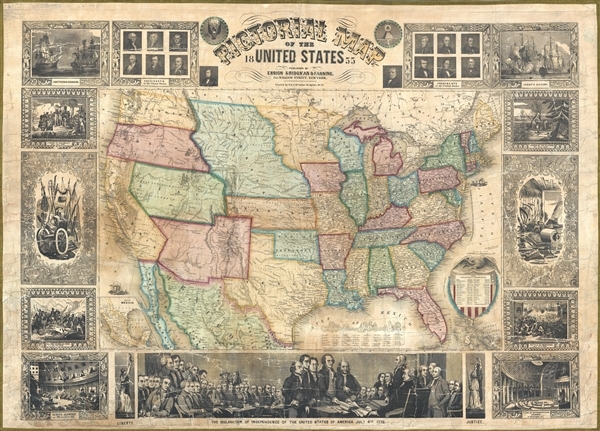 An appealing and decorative 1855 wall map of the United States. Issued by ensign, Bridgman & Fanning, this map was drawn and engraved by J.M. Atwood and covers the entire United States from Atlantic to Pacific and from Canada to the Gulf of Mexico. Cartographically Atwood's map illustrates an ephemeral period in the development of the American West with each of its five known editions exhibiting significant changes and updates. The present example, representing the fourth edition, reveals major developments in the American west following the events of the 1849 Gold Rush. The Gold Region itself is highlighted with Sacramento and Sutter's City noted. Great Salt Lake is presented in an embryonic form and indicative of the generally poor knowledge of the Great Basin predating the Railroad Surveys being conducted as this map went to press. Salt Lake City itself is identified as 'Utah City of the Great Salt Lake'. Both 'Utah' and 'Fillmore' are represented as regional capitals. The rail lines at this time extended westward no further than Jefferson City, Missouri, after which only wagon trains extending to the Pacific. Many of these are noted including the 'Route to Oregon' (the famous Oregon Trail), the 'Route to Santa Fe', and the southern route from 'Fort Smith to Santa Fe'. Other routes presented are the tracks of Fremont and the 'Great Spanish Trail from Los Angeles to Santa Fe'. Texas shows some development including an embryonic rail system running between Austin and the port of Galveston. Nebraska extends northwards to the Canadian border and both Washington and Oregon have their eastern terminus at the Rocky Mountains. The Apocryphal Louis Fork or southern extension of the Columbia River, named after Meriwether Lewis, is shown in southeastern Oregon. American Indian nations are identified throughout. A smaller map of Mexico appears on the lower left quadrant. This map was first issued by ensign & Thayer in 1847. It was republished by ensign & Thayer in 1849 (Rumsey 5057) and 1852 (Rumsey 3508) and then in its present form by ensign, Bridgman & Fanning in 1855 (Rumsey 265). A final edition by ensign, Bridgman & Fanning appeared in 1858. Good. Full professional restoration and stabilization. Overall toning and crackling.